Columbines are spring-blooming perennials with lacy foliage, and usually spurred two-toned flowers above the foliage on slender stems. Suited to a woodland area they can be grown here anywhere with good drainage and out of hot sun. Cut back after bloom to promote re-bloom in fall. Our summers are hot enough here that they are mostly dormant in the summer and though they like regular water will go with less if not growing much in the heat. They are not considered to be long-lived but will set seed for new plants if you let them. Let them seed themselves under oak trees. They are on the deer resistant list and attract birds and butterflies. Bare root- Save 10% on 5 or more and 15% on 10 or more. Now that the sun is out after that period of wet you can tell it is on its way back from its Southern reaches. Spring will be here before you know it. Bare root trees are here and roses are coming in the next couple of weeks. Plant these now. Summer bulbs come in February too. We are stocking up on spring blooming shrubs like Lilacs, Quince and Forsythia. 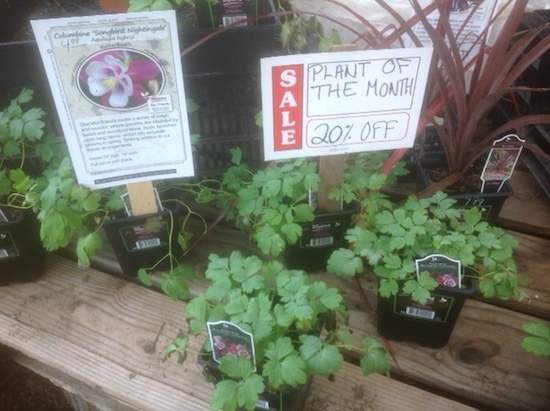 The Anemones and Ranunculas are in bloom along with Pansies, Violas, and Primrose. Early blooming perennials like Euphorbia, Erysimum, Veronica Georgia Blue, Lungwort, Creeping Phlox, Candytuft and Dianthus are budding up or in bloom now. You can still plant sweet peas from seed but you need to do it by the end of February or the very first of March. Now is the time to plant the early spring garden if you did not already do it in fall. These are the cool season veggies. If you are not sure what those are, just ask. You can start tomatoes from seed indoors in Feb./March along with peppers and eggplant but you have to wait till frost is over to plant them out. The 2019 seeds are here with a few things we have never had before. Coming with our spring bulb order are more onion and garlic sets if you did not plant in early fall. Potatoes are here. Feed your asparagus, artichokes, and strawberries this month. If you have not applied dormant spray yet to your roses and fruit trees now would be a good time. If you have not finished or even started pruning your fruit trees and roses you had better get cracking. 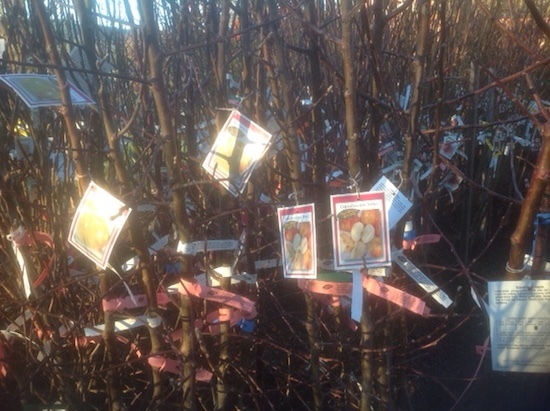 Our fruit tree supplier Dave Wilson has wonderful ‘how to prune’ videos on their website www.davewilson.com. Remember not to prune cherries and apricots now to avoid the disease Eutypa lata. Prune these after harvest in the summer. Top dress your trees and roses with Green-All Firmulch*. That’s the blue bag. Get your beds ready for planting. Adding organic matter like Green-All Soil Booster* (the orange bag), manures, worm castings, and compost are essential to replace all the nutrients the plants used last year. Remember annuals really deplete the soil quickly. Add calcium with lime and oyster shell. Add minerals back in with Kelzyme*, available here. Soil not loose? Add gypsum. Week plant stalks and canes last year, get Magnesium. Get the jump on spring by planting hardy perennials now. Selection is a little spotty but there are some available. Think Shasta Daisy, Dianthus and Carnations, Gallardia, Coreopsis, Rosemary, Lavender, Butterfly Bush, Coral Bells, and Foxglove to name a few. More should be coming as the season progresses. Plenty of hardy shrubs to be had now too that don’t mind the cold. Warmer days are ahead. Speaking of warmer days ahead, its hard to deny our climate isn’t changing. Wildfires have had a huge impact on us here in Lake County. Some say its poor forest management but is that really the answer? Humans have been arrogant and misguided to think they can control Mother Nature, especially since we have dishonored her so badly in the name of progress. What are some simple contributions we can do to stem the tide of global destruction? For one thing, we can shop locally. It saves on fossil fuels. We can plant more trees to cool our environment and save on electricity in the summer. We can grow more of our own food, depending less on big agri-business companies like Monsanto. We can fill our yards with climate appropriate natives and other plants for the birds, bees, and butterflies. We can fill our homes with de-toxifying houseplants. Did you catch our Pacific Coast Seed Bee, Butterfly, and Hummingbird Pollinator mixes? These are new to us this year, filled with pollinator-attracting native perennial wildflowers. Now would be the time to sow these out and help our native bee and butterfly populations. 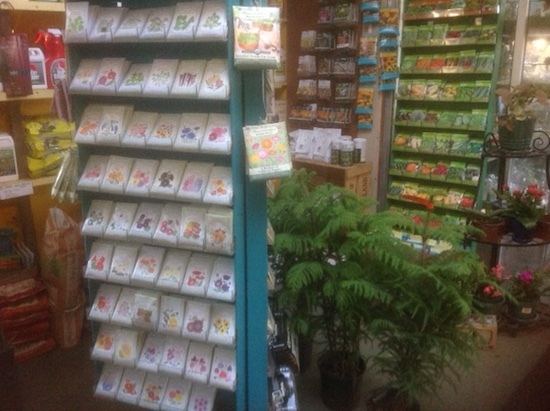 We have information here and can show you pollinator attracting plants for your garden. Plant a bare root tree or buy one for your friend who just got back into their new home. Houseplants make great gifts and Valentine’s Day is coming up. Feel good about gardening. It is good for you and the planet.